Milwaukee has a rich football history at a variety of levels: amateur, collegiate, high school, and professional. Although the sport had already attracted public interest in the nation and the state, perhaps the first notable game played in Milwaukee came on November 23, 1889, when a team sponsored by the Calumet Club defeated the University of Wisconsin by a score of 27-0. A Milwaukee-based National Guard team, Battery A, was the opponent of the Green Bay “town” or amateur team on Thanksgiving Day 1903. The Wisconsin Badgers even played select home games in Milwaukee from 1890-1905. From 1900 to the mid-1910s, city football leagues featured such teams as the Arlingtons, the Colts (sponsored by the Schmidt Beer Company), the Gaulke Pianos, the Sisson Clothiers, and the Mitchell Street Banks. The Arlingtons were city champions in 1911, 1913, and 1914. The Milwaukee Amateur Football Association, overseen by Harold “Zip” Morgan, reached its zenith by the 1920s with divisions aligned along weight and skill levels. Teams were frequently organized by neighborhoods, ethnic groups, and churches. The highest level of the “amateur” leagues was comprised mainly of athletic club teams, some of whom were actually semi-professional. 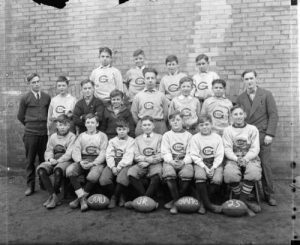 In November 1919, one of them, the Maple Leaf Athletic Club, played the Green Bay “town team,” a forerunner of the first Packers squad, losing 53-0 at Green Bay’s Hagemeister Park. High School football emerged at about the same time as adult football. The South Division High School team dominated the city from 1911-1915, with several players going on to play in the fledgling National Football League. Crowds in the thousands attended key high school games, often staged as doubleheaders on Saturday afternoons at Athletic Park, renamed Borchert Field in 1928. 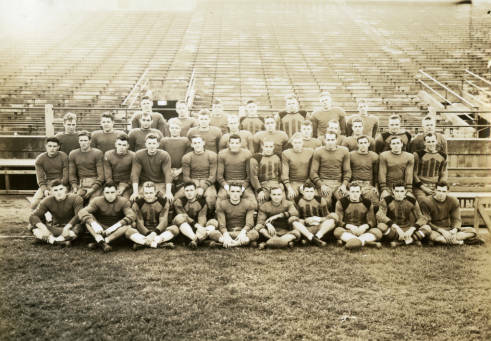 During the 1920s and 1930s college football was “king” and for a short time in the early 1920s even the Milwaukee School of Engineering (MSOE) fielded a team. Across the river and west of MSOE, Marquette University had a very competitive team during that time, even playing Texas Christian University in the 1936 Cotton Bowl. Future Green Bay Packers stars “Lavvie” Dilweg and “Red” Dunn, both Milwaukee natives, played at Marquette. Lisle Blackbourn served two stints as Marquette’s varsity coach from 1950-53 and from 1959-60, when the program was dropped; he was head coach of the Packers from 1954-1957. Milwaukee State Normal School (later Milwaukee State Teachers College and then the University of Wisconsin-Milwaukee) had a football team from 1898-1901 and from 1911-75, with a hiatus during World War II. The Milwaukee Badgers, an early NFL team, played five seasons (1922-26) at Athletic Park before folding operations. 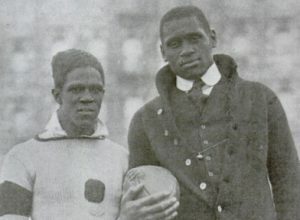 In 1922 actor, singer, and social activist Paul Robeson played for the Milwaukee Badgers, which also featured during its short history members of the NFL’s Hall of Fame: Jimmy Conzelman, Johnny “Blood” McNally, and Fritz Pollard. After the demise of the Badgers, Milwaukee had two independent professional teams, the Eagles (1927) and Nighthawks (1930), the latter sponsored by Otto Haederer of the Milwaukee Furniture Company. Their schedules included several home games against established NFL teams. From 1940-41 Milwaukee had an entry in the third incarnation of the NFL’s rival, the American Football League, called the Chiefs. Headed by George M. Harris, Richard A. McDermott, and Chester W. Wilson of the Milwaukee Football Club, the Chiefs posted an overall winning record of 11-5-1. Milwaukee’s main contact with professional football after the 1930s came with a regular slate of Packers games each year. The team had played in a game at Athletic Park against Racine in 1922, and in 1933 the Packers played a single game at Borchert Field. From 1934-51 the team played games at State Fair Park’s “Dairy Bowl.” Marquette Stadium was the venue for selected Packers’ home games in 1952, and with the completion of County Stadium in 1953, the team played two or three “home” games there through the 1994 season. An alternative to Packers games could be found indoors during the 1990s and 2000s. The Milwaukee Mustangs played in the Arena Football League from 1994 to 2001 and again after 2011. In between, the Bonecrushers and the Iron played in the Arena League. ^ Denis J. Gullickson and Carl Hanson, Before They Were the Packers: Green Bay’s Town Team Days (Black Earth, WI: Trails Books, 2004), 18 and 48-50. Note: The Wisconsin Badgers played home games in Milwaukee during the seasons 1891-1892, 1898-1902, and 1904-1905. Wisconsin Football Factbook, updated February 3, 2011, accessed August 30, 2015. ^ Keith McClellan, The Sunday Game: At the Dawn of Professional Football (Akron, OH; University of Akron Press, 1998), 284-286, 289. ^ Michael D. Benter, The Badgers: Milwaukee’s NFL Entry of 1922-1926 (Haworth, NJ: St. Johann Press, 2013), 10 and 173. ^ Gulickson and Hanson, 217. ^ South Division High School, The Cardinal (yearbooks), 1911-1916, South Division High School Library archives. ^ “We Were Marquette Football,” MarquettteWire, accessed August 30, 2015; Denise Gergetz, archivist, Milwaukee School of Engineering Walter Schroeder Library, email correspondence to author, September 27, 2014. Electric Sparks and Sparks publications of MSOE from the period 1919-1921 reference the school’s football team. ^ UWM Golda Meir Libraries, “Timeline—Football at the University of Wisconsin-Milwaukee Archives Department,” last accessed August 25, 2016. ^ Benter, The Badgers, 22-23, 72. The fact that the team’s first recognized coach was half Native-American (Al “Budge” Garrett) and that end John Alexander was Jewish, and Pollard, Robeson and Slater were African-Americans, made Milwaukee somewhat of an anomaly in what was then a distinctly white, Anglo Saxon and Protestant league. There is also compelling evidence that Pollard was either the team’s de facto head coach or was involved in a co-coaching tandem with Garrett. ^ Bob Gill, “Requiem for the Nighthawks,” Coffin Corner (Professional Football Researchers Association) 14 (5) (1992), last accessed August 25, 2016. ^ Bob Braunwart, “All Those A.F.L.’S: N.F.L. Competitors, 1935-41,” The Coffin Corner 1 (2) (1979), accessed August 6, 2015. ^ “Titular Game to Be Played in Dairy Bowl,” Milwaukee Journal, December 6, 1939; “Milwaukee County Stadium,” Packerpedia, accessed August 30, 2015. ^ “Milwaukee Iron Backs up Playoff Guarantee with Free Tickets,” Milwaukee Business Journal, March 16, 2010, accessed August 6, 2015. Greene, Neal T. “Identity Consumption: The Milwaukee Badgers Professional Football Club and the Commodification of Race, Masculinity and Sports Culture in the 1920s.” MA thesis, University of Wisconsin-Milwaukee, 2006. McClellan, Keith. The Sunday Game: At the Dawn of Professional Football. Akron, Ohio: University of Akron Press, 1998. Morgan, Thomas J., and James R. Nitz. “Magical Borchert Field.” Milwaukee History 15 (Winter 1992): 98-111. Names, Larry. History of the Green Bay Packers: Part One, The Lambeau Years. Wautoma, Wisconsin: Angel Press, 1987.